About 1870, in the St. John’s College Eagles, then mainly a cricket club, a proposal was made that members of other colleges be admitted. The proposal failed, but the decision led to the formation in 1872 of a University wide equivalent, the Hawks’ Club, which took as its colours the maroon and gold which have since become synonymous with sporting excellence throughout the world. Early records suggest that it too was primarily a cricket club, the President being J R D Hill (1872-73) a Trinity lawyer who died at the age of 31, W H Foster (1873-4) a Yorkshireman at the Non-Collegiate Students Board (now Fitzwilliam College) who moved to St John’s, and S C Boulter (1874-5) of Clare, another lawyer, who founded the Law Debenture Corporation. Curiously none of these seems to have represented the University against Oxford at any sport. However, photographs of them do survive, but there is then a gap until 1889-90, when Rowland Alwyn Wilson, (Rugby School and Trinity) who won an athletics Blue in the mile and later became a Canon of Worcester Cathedral, begins a line of famous Presidents whose pictures hang in the Clubhouse. This line runs until 1963 after which records and pictures are, alike, patchy. By any standards the Presidents of the 1950s and 60s are a distinguished collection: Peter May (1951), Arthur Smith (1956), Ted Dexter (1957), Geoffrey Windsor-Lewis (1959), Gordon Waddell (1961), Tony Lewis (1962) and Viscount Chewton (1963) are all examples. The fact that this selection contains three cricket captains of England, two Scottish rugby players two Welshmen, a golfer and only one oarsman makes it all the more remarkable and indeed typical of the Club. Turn of the century group photographs, in which remarkable specimens of neckwear and moustaches are prominent, reveal attitudes suggestive of agility and strength rather than the dully formal ‘back row standing, middle row sitting and a couple of small ones on the ground’ which later became traditional, but more recently have returned to less formal poses. Despite enormous growth in Cambridge student numbers and in the number of sports which they compete with Oxford, the Hawks’ Club remains unashamed in its promotion of sporting excellence. Indeed, its Members, once the sporting top five per cent are now the top one per cent. The number of Resident Members of the Club in statu pupillari is limited (currently 220), but subject to the decision of the Residents’ Committee of the time and membership, while not absolutely confined to Blues and Half-blues, is usually restricted to them. Election is in the hands of a small Committee of Resident Members, guided by the Club’s Trustees, who are Senior Members. Candidates have to be clubbable, to go beyond the immediate circle of their own sport and must number Committee Members among their proposers and seconders. Membership is for life. 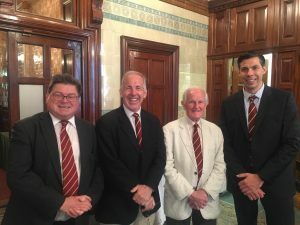 The Committee can very occasionally offer Honorary Membership to those who have helped the cause of Cambridge sport to an exceptional extent, such Members being distinguishable by the addition of a gold hawk on their maroon and gold tie. Since 1993 there is a further class of Member, wearing a tie with a gold hawk triumphant on a dark Blue background, the Dining Rights Members, either male or female, paying an annual subscription for the use of the Clubhouse, but not becoming a Hawk. The first Clubhouse was in Trinity Street rooms, but by the 1890s a St John’s College property at 2 All Saints’ Passage, had become home to the Club. Initially sub-tenants of Dr Thompson, the Club took over his tenancy in 1901 and remained there for over sixty years, despite having to close down for three years during both world wars. On the second occasion, the Club reopened in 1945 in Jesus Lane until its home could be de-requisitioned, repaired and redecorated. Jesus Lane, in the shape of the Pitt Club, again came to the rescue when, in 1966, financial considerations led the Club to vacate 2 All Saints’ Passage. Although Hawks had happily co-existed with law coaches and later with the Arts Council as their sub-tenants, different objectives made uncomfortable bedfellows of Hawks and Pitt Members and for a few years the Club again became homeless, to be rescued this time by the enterprise of a member, Douglas Calder, who in 1986 spotted the opportunity presented by a dilapidated hotel / staff hostel up for sale at 18 Portugal Place. With a few friends, he purchased it, then fund-raising began for development and a company was established to run it. Many distinguished Hawks contributed on the way to an official opening by His Royal Highness Prince Philip, the Duke of Edinburgh, in October 1992. Prince Philip, who has been an Honorary Member since 1950, was not the first royal member. King George VI, a good lawn tennis player, the Duke of Gloucester, who played polo for the University and Earl Mountbatten were all elected as undergraduates in 1919-20. Nor was he the last. HRH Prince Charles, another polo player, was elected in 1968. There has always been a strong social side to the Hawks’ and in the 1920s there were annual Balls in Cambridge and London. Since 1936 there has been a London Dinner, on the eve of the Twickenham Varsity Match – in the 1950s it was on the third evening of Lord’s Varsity match. Resident Members have a variety of events, chief among which is a Charity Dinner and in May Week, the ‘Hawks’ Event’ – an extended party taking place at Fenner’s. There has also been a Cambridge Dinner for Members and spouses too. The heart of the Club is its Clubhouse. In the days of All Saints’ Passage the Steward held almost mythic status. Alfie Wakeling reigned for 40 years from 1901-41, followed by Harry Lambert (and Edna) for the next 25. Nowadays, staff are considerably more mobile, but still they must play host not only to the Members in residence, but also to visiting All Blacks, Springboks, Samoans – whose height and bulk test the dimensions of the bar – oarsmen, Vincent’s Members and also to judges, doctors, parsons, accountants, schoolmasters, knights and lords, captain of industry, farmers, MPs and Heads of Houses who return for ‘auld lang syne’. To borrow the words of Dr Whitehorn, Treasurer of the Club from 1941 to 1960, beside the many Olympians, internationals and sporting greats ‘the stout fellows who don’t get Blues, but have been and are the making of the University’s fellowship in sport and life – those are the Hawks too. Long may they flourish’.